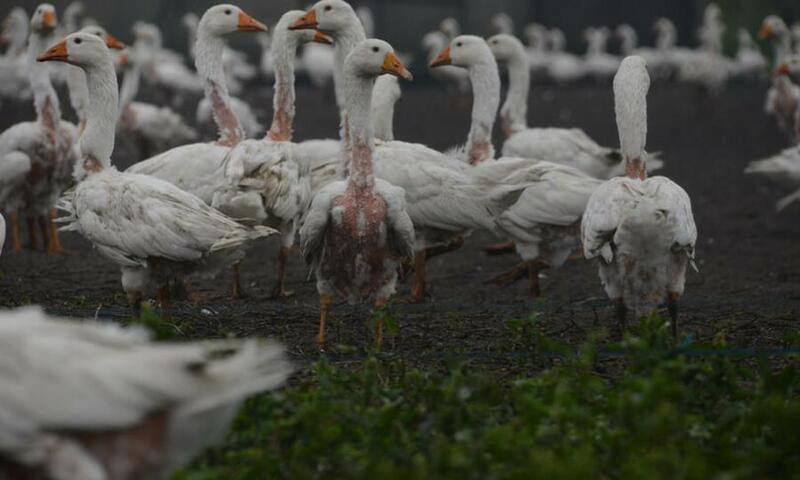 While most down and other feathers are removed from ducks and geese during slaughter, birds in breeding flocks and those raised for meat and foie gras may be plucked repeatedly while they are still alive. Given the cruel and inhumane treatment endured by birds used for down, the Board is strongly encouraged to enact a policy ensuring that no products containing down are sold by lululemon athletica inc. Birds used for down are often subjected to intensive confinement on filthy factory farms before they're loaded into open-air trucks, exposed to all weather extremes, and hauled to the slaughterhouse. A PETA eyewitness exposé revealed that birds raised for down were crammed into cages for transport with such force that many sustained bruises, broken bones, and dislocated joints. The cages were so small that the birds were unable to hold their heads up even while sitting, and they were left in the feces-strewn crates for up to 24 hours without food or water. At the slaughterhouse, they're often improperly and ineffectively stunned before their throats are cut and they're dumped into the scalding hot water of the defeathering tank. Selling down - a product that causes so much suffering - is not only cruel but also inconsistent with our company's promotion of compassion and environmental stewardship as well as its yoga-inspired vision of being part of "an elevated world that operates within nature's boundaries." Condoning the cruelty inherent in down production is in stark contrast to lululemon's purported values. Our company understands the benefits of cruelty-free synthetic materials, as it already sells high quality alternatives to down. Phasing out down would be easy as well as a compassionate choice. By eliminating down from its offerings, lululemon would prevent an enormous amount of suffering for birds and demonstrate that it is highly innovative, distinctive, competitive, and humane. Accordingly, we urge shareholders to support this ethically responsible resolution.